I used to be a big proponent of manhood studies, once even convincing my husband to undertake one with our son. Now, however, I wonder if there isn’t a dark side to our well-intentioned efforts to aid men in becoming who God intends them to be. Christian manhood teachings increasingly stress the leadership role of men, telling guys they are the spiritual leader in their home charged with the task of leading family devotions, hearing from God, and making the final decisions. The burden of leadership is too great for women, so it goes, so men should humbly accept this God-ordained responsibility and get on with it. From this perspective the biggest problem with men is that too many are not stepping up; instead of taking the lead they have become passive. The greatest challenge wives face with their husbands is not abusiveness; it’s passivity. Very few women deal with truly abusive husbands, but lots struggle with a man who dumps his responsibilities on his wife. It very well may be that more wives encounter irresponsibility than abuse in their marriages. Good husbands don’t want to abuse their wives so they don’t resort to that. But husbands can still get frustrated and end up pulling back, taking less initiative than they ought. Manhood teachings tell us the reason is that men and women are not embracing their roles. Men need to be directed “toward a self-denying, other-serving embrace of the leadership role” and women “toward a joyous embrace of godly, male leadership in the church [and home].”  Men are passive either because they don’t know they were created to lead their wives and families, they’re tired of trying to lead a wife who doesn’t respond appropriately, or they’re just plain lazy. I’m not so sure about all of that. The trajectory to male passivity, which I acknowledge as a reality, is complicated. And I believe manhood teachings themselves play a role in catapulting great guys into this abyss. Men are taught that they possess a unique leadership role and ought to dominate spheres of eternal significance. Husbands are supposed to figure out what is best for their marriages, direct their family life, and make the hard decisions. If they do these things, their families will be protected from harm and God’s purposes will be accomplished in their homes. Their wives should be supportive and submissive, getting behind their husbands with enthusiasm, since that is how God will protect the entire family from bad decisions. Both men and women are taught that everyone wins when the system functions as designed. A husband comes away from these studies believing, in a sense, that God wants him to get his way, since God has given him a greater ability than his wife to see what his family needs. God has entrusted him with the final decision-making authority, so he needs to determine what he believes is best for his wife and children and make those decisions, even when the rest of the family thinks he’s wrong. If a husband goes along with his wife, or even acknowledges that she might be right in some point, he fears he is abdicating. His family might miss God’s perfect will if he yields to his wife, especially if her idea makes no sense to him. His wife, on the other hand, is to be supportive and submissive, getting behind his leadership with joyous enthusiasm. She is to accept the fact that God’s will for their family will come primarily through her husband, although on occasion God may use her to gently and respectfully influence him. Most of the time, however, if God has to resort to speaking to him through his wife, the husband knows he has been remiss in some way. He should have been praying more or reading his Bible more, thereby giving God greater opportunity to speak directly to him. Yet that’s not the way it tends to work out in real life. What really happens often goes more like this. The husband tries to be a great husband by taking the lead, making all or most of the final decisions for himself, his wife and his children. He may feel uncertain about his ability to figure all this out, but he steps up anyway. Most of the time he thinks he makes pretty good decisions, although now and then one doesn’t turn out the way he hoped. But he’s doing the best he can and is, therefore, surprised by how his wife responds. Here’s how that tends to play out. His wife questions his judgment at times, tries to give him advice, and doesn’t always jump on board immediately and enthusiastically. Rather than maintaining her positive attitude, she even gets upset when a particularly bad decision is made, something that happens to all of us at times. He is disheartened by her response and doesn’t know what to do to make her happy. Finally, he gets tired of fighting with her, doesn’t want to talk about it, and just wants to be able to do what he thinks is right. When his wife insists on being part of the process, he gives up and resorts to passivity. So what led to the husband’s passivity? A confusion of proper gender roles? Or was the husband set up for failure by a description of manhood that is not only impossible to achieve, but also misleading? Do typical manhood teachings harm good men by leading them down a path that can result in passivity? Do they harm good men by making marriage harder than it needs to be? Manhood teachings present husbands with an impossible task: to be the leader the family can depend on to solve every problem, make one great decision after another, and not make mistakes. Wives are set up to expect the impossible: a “head of the house” who always takes the initiative, discerns God’s will accurately, and takes the lead with the children. When it doesn’t work out that way a wife is disappointed and her husband is demoralized by her disappointment. She turns into a nag and complainer and he becomes defensive and angry. What is the solution? More emphasis on gender roles? I used to think so, but I don’t anymore. Here’s what I suggest. Instead of the usual manhood teachings we could explain that yes, husbands need to step up and take initiative. They ought to guard against passivity and the tendency to pass the buck that all humans possess, men and women alike. But we need to add that this stepping up takes place within a partnership of two equal beings, each of whom should take initiative when they ought. Manhood studies could explain that this partnership includes another person with a different perspective and distinct priorities, and that it can be just as appropriate and biblical for him to yield to her as it is for her to yield to him. That right there is the crux, what some of you are questioning right about now: that it can be just as appropriate and biblical for a husband to yield to his wife as it is for a wife to yield to a husband. I get it. I was with you for a long time. I was convinced that submission in marriage was fully my job. I no longer believe that’s either biblical or logical. Here’s why: there are too many Bible stories that demonstrate the validity of good, strong, healthy give-and-take between women and men, husbands and wives. So instead of what is usually taught, manhood studies could demonstrate the legitimacy of a husband yielding to his wife and a wife admonishing her husband by utilizing those Bible stories that are typically hidden away in women’s Bible studies. They could talk about how God used Huldah to speak hard truths to the king and the nation when it would have been possible to go to Jeremiah instead. They could show how an amazing leader like David needed a woman named Abigail to keep him from screwing up royally, before he ever became a royal. Manhood courses could plumb the depths of the Shunammite, one of the most respected women in the Bible. These men’s groups could sit around discussing the significance for their own lives of this woman who took a whole lot of initiative in her marriage. They might consider the fact that the Shunammite’s husband went along with her suggestions, was blessed with a son because he did, and ponder how that speaks to their own marriage. Biblical manhood studies could talk about the real-life marriage of Sarah and Abraham, not just the idealized version based on what Peter says about Sarah obeying Abe. They could discuss how Abraham suggested a course of action at times, sometimes good and sometimes not so much – and how Sarah did the same. Men could grapple with Genesis 21:12 where God commands Abraham to listen to Sarah which, by the way, didn’t mean showing empathy without fixing her. It meant do what she says. These men’s Bible studies could attempt to uncover the real reason Rebekah deceived Isaac. Was it because God had revealed his plans for Jacob and Esau to Rebekah, but Isaac wasn’t listening to his wife? Would Rebekah have resorted to manipulation if she had felt free to share what she knew with her husband, and Isaac had gotten on board with God rather than fighting against him? 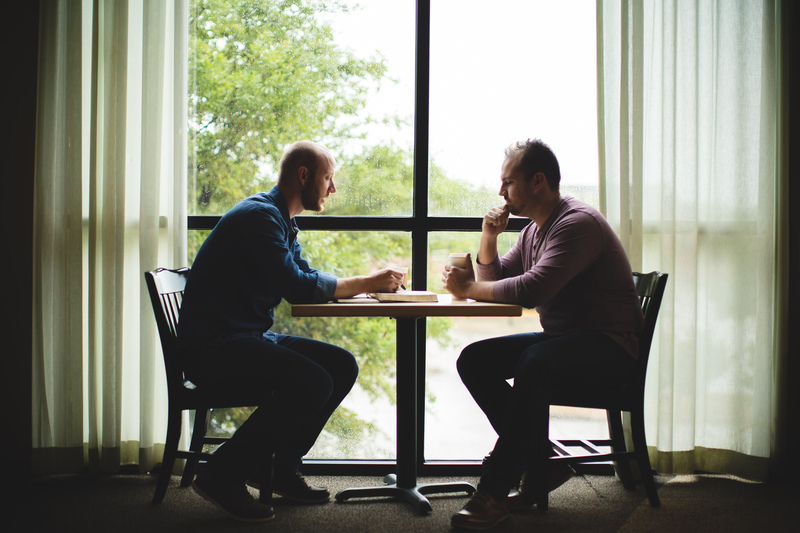 Manhood courses could take a fresh look at the command to submit to one another in Ephesians 5:21. Instead of assuming husbands are exempt from yielding to their wives based on verse 22, men’s groups could discuss what healthy mutual submission might look like in marriage. Instead of teaching that a husband should never yield to his wife against his better judgment, the true meaning of submission could be brought to light. Submission means to yield, and yielding is not yielding until we submit to something we neither desire nor agree with. Until we cross that line, we have not submitted. In their discussion of mutual submission, men’s Bible studies could talk about some of the reasons a husband might yield to his wife. Sometimes she will know better, sometimes she will hear from God before he does, and sometimes God will use her to correct him. Other times he will yield to demonstrate his love, to prove that he really does think of her as a complete person equal to himself or, frankly, because the decision will impact her life more than his. Good men are being negatively impacted by some of our manhood teachings, becoming passive or angry or defensive when their attempts at unilateral leadership are not automatically and joyously embraced. With little direction on how to be a collaborative leader (that has a much greater chance of success), too often husbands are left feeling like a failure. I hate seeing good men set up for frustration, for a lifetime of difficult interaction with the person who ought to be their greatest source of comfort. I think we can do better. Why don’t we try? J. Ligon Duncan and Randy Stinson, in the preface to the 2006 edition of Recovering Biblical Manhood and Womanhood (Wheaton: Crossway, 1991/2006), x. See, for example, the introductory video trailer to Authentic Manhood’s “33 the Series” men’s Bible study, which exhorts men to “imagine a world where men dominate areas of eternal significance,” https://www.authenticmanhood.com/video-trailers/. Accessed 2/8/2018. Abraham moved his family out of an idolatrous environment but also asked Sarah to lie about being his wife. Sarah offered Hagar as a means for Abraham to have a son but also recognized that Ishmael’s continued presence would jeopardize Isaac’s future. However Sarah may have obeyed Abraham and whatever she may have called him (Peter says she called him “lord”), she was an active partner in her marriage, and their marriage reads like a marriage of equals. Genesis 27 needs to be read in light of Genesis 25:21-34, particularly vv. 21-23. This entry was posted in Bible, Ephesians, Gender, Leadership, Manhood, Marriage, Men, Relationships by Sarah J. O'Connor. Bookmark the permalink. I think one of the problems with manhood teachings is that they have almost presented a one-size-fits-all solution that doesn’t take into consideration different relationships – which are even more unique than individuals are, because they are the interaction between two unique individuals. A specific piece of great advice to one couple could mean disaster if given to another. We can’t assume that all women are domineering and need to back off and chill out, and that all men are spineless and need to “man up”. I think another key issue when you ask men to “lead” is that they need to know what biblical servant leadership truly means before they can heed the advice properly. Without a biblical concept of leadership, the advice to lead can be interpreted as “don’t listen to others, they should listen to you – don’t submit to others, because they should submit to you.” But a biblical leader should model listening by listening, should be an example of submission by submitting, and should model humility by humbling themselves. I also think too much focus is given to gender. I believe if we would all just focus on being more like Jesus, and submitting our thoughts and will to him, men will become better men, and women will become better women! Keep writing – it’s a blessing!! Thanks for the comments, Pierre! Yes, we forget to take into account how much relationships can vary from each other and allow the individuals to work out their marriage in a mutually satisfying way. We tend to box people into formulas rather than letting them figure out for themselves how to build a loving, God-honoring lifelong relationship.I believe the marriage that most reflects Christ and the church is the one where two people have a deep, heartfelt devotion to one another. That is the point of the marriage analogy anyway – to help us understand how greatly God loves us. I love what you say about leadership too. Thanks for reading!